Text field to copy and paste hex color values. Old and new colors displayed side by side. Optional selection of "no color". Proper behavior when orientation changes. gives higher hue precision than a square picker of the same size. allows easier selection of pure white than a circular picker. A demo is available on the Play Store. Source code for the app is in the demo_app folder in this repo. Add jcenter() to your repository list if it isn't there already. Add the ColorPreference to your preference screen xml. Don't forget the extra xmlns: declaration if using the custom attributes described below. The standard preference attributes apply as normal, including defaultValue, which can be a hex color, as in the example above, or a reference to a color defined elsewhere. In addition, the following custom attributes may be used. They should be prefixed with the namespace used for res-auto, as in the example below. 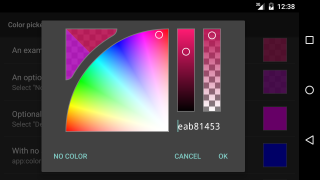 If set, this text will appear on a third button on the color picker dialog. This resets the color setting to the defaultValue if set. If there is no defaultValue, any saved color setting is removed. Apps can use this to implement "no color selected" logic. Use SharedPreference.contains("myOptionalColorKey") to test for that. This text displays as the preference summary text if no color has been selected. Set this to false to hide the alpha slider. Set this to false to hide the hex value field. Set this to false to hide the color preview field. 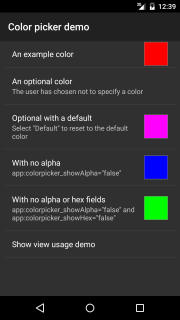 Note: colorpicker_defaultColor was removed in version 2, in favour of android:defaultValue. If upgrading, just switch to using android:defaultValue instead. There are further examples in the demo app. Refer to the ColorPreference source for a fuller example. The custom attributes above should be prefixed with the namespace used for res-auto, just like the preference attributes. See the view demo source for an example. Sets the original color swatch and the current color to the specified value. 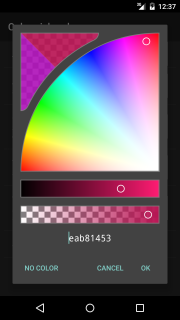 Sets the original color swatch without changing the current color. Updates the current color without changing the original color swatch. Shows or hides the alpha slider. Shows or hides the hex value field. Shows or hides the color preview field. Allows an object to receive notifications when the color changes.